Nearly 17 years after passengers on a hijacked flight from New Jersey to California fought back against a band of terrorists who then crashed the jetliner into a rural Pennsylvania field, a symbol of their bravery and sacrifice will be unveiled Sunday at the place where they fell to earth. The Tower of Voices, a roughly 93-foot- (28-meter-) tall concrete and steel structure, is designed with a wind chime for each of the 40 passengers and crew members who were killed on Sept. 11, 2001, and represents the final phase of the Flight 93 National Memorial . Each chime will generate its own distinctive sound. “Together their voices will ring out into perpetuity, with this beautiful Somerset County, Pennsylvania, wind,” park Superintendent Stephen Clark said. The memorial at a the crash site, about 2 miles (3.2 kilometers) north of Shanksville, already includes a memorial plaza, dedicated on the 10th anniversary in 2011, and a visitor’s center that opened three years ago. Family members and visitors streamed into the park Sunday morning, as a cold, driving rain pelted the mountainous region. Former Pennsylvania Gov. Tom Ridge, who served as the nation’s first homeland security secretary after 9/11, will make the keystone speech. Other speakers include the park’s architect, its superintendent, and a family member of flight crew member killed in the attack. At the heart of the Tower of Voices are the chimes, aluminum tubes that range from 5 to 10 feet (1.5 to 3 meters) long and weigh as much as 150 pounds (68 kilograms). They have been tuned, but no one can be quite sure how they will sound until they are installed. 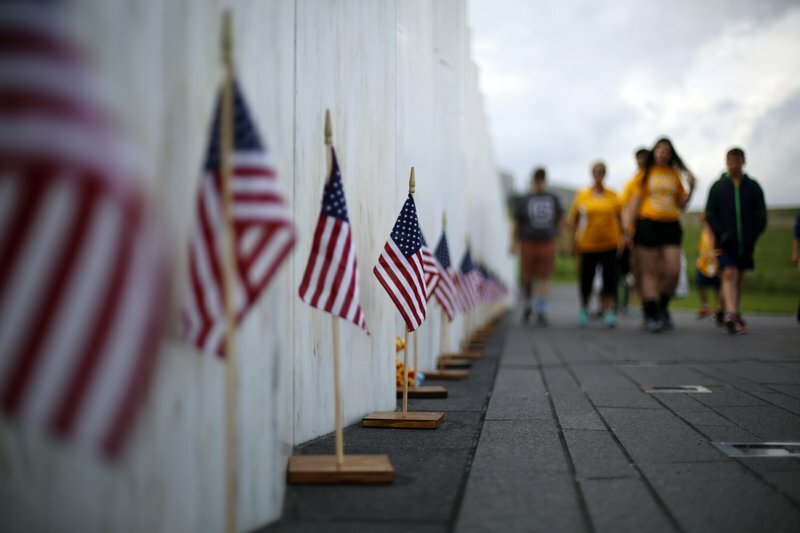 Nearly 3,000 people died in the Sept. 11 attacks, when terrorists seized control of four planes. They flew two of them into the World Trade Center skyscrapers in New York and the fourth into the Pentagon in Arlington, Virginia, just across the Potomac River from Washington, D.C. The Flight 93 passengers learned in mid-flight they had been hijacked and responded heroically, declaring “let’s roll” as they acted to confront their adversaries inside the plane. Officials concluded the terrorists were aiming the Boeing 757 toward Washington, to be used as an enormous airborne weapon. Thirteen passengers on the plane made a combined 37 phone calls during the attack, getting information about the other three hijackings and crashes. As some passengers apparently tried to storm the cabin, the hijacker at the controls then rolled the plane, trying to throw them off balance, before the aircraft became inverted and crashed at 563 mph (906 kph) on the edge of a reclaimed strip mine at 10:30 a.m. The impact ignited about 100 hemlock trees. Hemlocks are used as symbols throughout the memorial’s design. A 17-ton (15-metric ton) sandstone marks the impact site, located within a 44-acre (17.8-hectare) fenced-off area of the crash debris field referred to as the “sacred ground.” Access to that part of the park is limited to family members of the passengers and crew. Four 40-foot (12.2-meter) containers of remaining debris from the crashed airplane were buried within the sacred ground area during a private ceremony on June 21. The memorial was funded with $46 million from 110,000 private donors, including $6 million to design and build the Tower of Voices. Volunteers are well on their way to the goal of planting 150,000 seedlings around the 2,200 acre (890 hectare) park. It attracted about 400,000 visitors last year. The dedication comes two days before the anniversary of the Sept. 11 attacks. President Donald Trump is expected to attend that memorial ceremony Tuesday in Shanksville, along with Pennsylvania Gov. Tom Wolf and Interior Secretary Ryan Zinke. Shanksville is about 75 miles (121 kilometers) southeast of Pittsburgh.